A new interview between renowned college experts David Montesano and Anthony-James Green encourages students to ignore most details and to narrow their focus as early as possible in their high school careers. 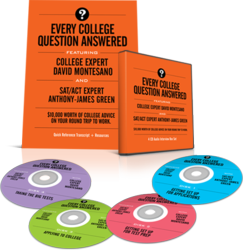 Montesano and Green have just combined their perspectives on a new recorded interview, Every College Question Answered, which they hope will topple the deep-seated and ill-advised college beliefs currently held by many American students and their parents. Every College Question Answered combines the perspectives of test prep and college admissions consulting. This idea of the "Jack of All Trades, well-rounded applicant" couldn't be more misguiding. Schools want well-rounded classes, not well-rounded students. Most parents are well-familiar with the idea of the "well-rounded student." As the story goes, the student who's most capable in the most different areas will have the best chances of admission at the nation's most competitive schools. A new interview between two of the country's leading college experts, David Montesano and Anthony-James Green, violently debunks this myth and points instead toward the importance of specialization. Montesano, a world-renowned college admissions consultant and founder of College Match College Consulting, had this to say about the overall message of the interview: "Your grades and your test scores open the door for you, but if there's nothing behind the door, you're in big trouble. Students without a specialty of some sort or another are at a massive disadvantage when it comes to college admissions. Students need to pick an area of expertise as soon as they possibly can, and they need to form their applications to reflect that expertise. If they don't, they're never going to stand out to admissions officers." "I'm a test prep expert. That's all I know, and I spend all my time learning more about ways to teach the SAT and ACT effectively. The problem is that all of my clients are going through the college process, and they often look to me for college-related expertise that I don't have. Similarly, David's clients are all going through the test prep process, and they're always looking to him for SAT and ACT guidance - but, again, he's not an SAT tutor - he's a college specialist. We often have to call each other and refer clients to each other just to make sure that they're totally taken care of. Our areas of expertise are two pieces of the same puzzle, but no one has ever bothered to put that puzzle together before and create a cohesive resource for college advice. A few months ago, Green and Montesano set aside a few hours to "pick each others' brains" and get all the necessary information they needed to answer their clients' most common college questions. Green needed to learn more about the college admissions process, and Montesano needed to learn more about the test prep process. "I could raise a students' SAT score by hundreds of points, but I had no real idea what the difference between Early Action and Early Decision was," jokes Green of the process. "Similarly, David wasn't sure whether his students should take the SAT or the ACT when they were gearing up for test prep. These are absolutely essential decisions, and we set aside a full day to get all of our questions answered." At the end of their conversation, Green and Montesano immediately realized that they needed to record it and make it available to students and their parents. "It was insane how much ground we covered in such a short period of time," says Montesano of the finished product. "We combined two perspectives that sorely needed to be combined. Interestingly, it was the concept of specialization that kept coming up from both sides." Montesano encourages students applying to college to forgo their peripheral activities and focus aggressively on the one or two areas where they can market themselves most effectively. "Colleges don't want some kid on three JV teams, in eight clubs, with a C+ average, mediocre test scores, and no idea of what he wants in life. They want to create classes full of specialists. They want an incredible athlete, an amazing architect, a passionate writer, etc. Students need to figure out what they want most out of life, pick the colleges who will give them the best chances of getting it, and make that case to the colleges they apply to." Green's test prep strategy is nearly identical. "If a student wants to raise his SAT score, he needs to figure out exactly where he's weak, and then he needs to focus on that weakness like a laser. If someone isn't good at triangular geometry, she needs to eat, breathe, and sleep triangles until she's a triangle expert. If students pinpoint, specialize, and knock out their weaknesses one-by-one, they'll see meteoric test score improvements. David and I do very different things, but the concepts we teach are the same: hone in on what's most important, and let the rest fall to the wayside."